More on Emma Rose, 1909. Emma Rose, living in New York, 1909.
WHO CAN PICK OUT HOUSE WHERE EMMA ROSE WAS BORN? An Interesting Letter From a Woman Who First Saw the Light in Honolulu—Remembers Old Landmarks. Euginia Keohokalani Maluhi Pilipo and Manuel Reis married 50 years, 1929. At the hour of 3 in the afternoon, of this past Wednesday, Dec. 4, Mr. and Mrs. Manuel Reis opened their home to welcome their many friends who went to honor them for their fifty years of marriage. Euginia Keohokalani Maluhi Pilipo and Manuel Reis were married on December 4, 1879, at 8 o’clock that night in the Roman Catholic Church by Bishop Halemano. Mr. Reis arrived in Honolulu nei in 1875 as the result of an accident. He was working aboard the whaler Atlantic [moku-o-kohola Akelanika] and sailed here to the Pacific Ocean. One night their whaler crashed into another whaler, but neither sank. Both captains of the damaged ships decided to sail for Hawaii, 4000 miles away, whereas from where they crashed it was only 2000 miles away from the closest land. 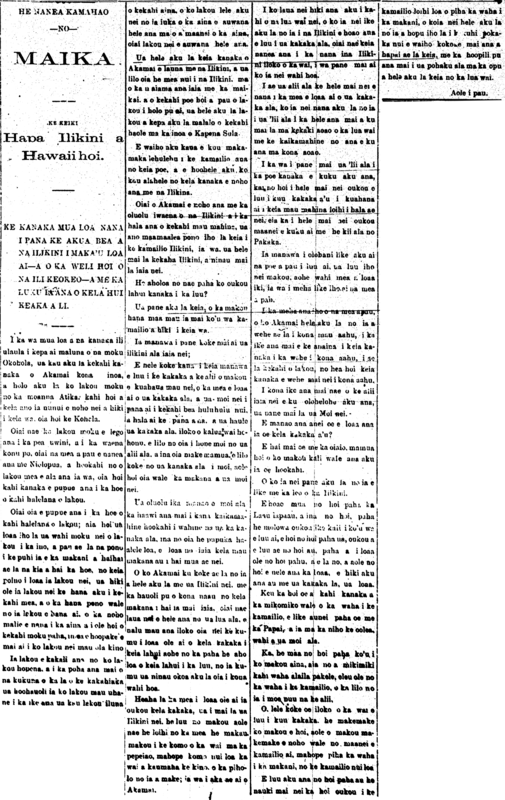 Reis landed in Hawaii nei on September 12, 1875. He became sick, and because he did not get well before the ship left, he was left behind here in Honolulu, and that is why he lived here and married his wife of fifty years of marriage. Mrs. Reis was born in Honolulu nei in January 1865. They have three children; one boy and two girls. The girls are school teachers for our government schools. Ke Alakai o Hawaii, Buke 1, Helu 33, Aoao 1. Dekemapa 12, 1929. Maika, the half Indian, half Hawaiian, 1892–1893. THE FIRST MAN TO SHOOT THE BEAR GOD GREATLY FEARED BY THE INDIANS—AS WELL AS THE TERROR OF THE WHITE SKINS–AND THE MASSACRE OF THE THEATRICAL GROUP OF LEE. When the first brown skins were first contracted on Whaling ships, a man named Akamai boarded and their ship left for the Arctic [Atika] where that kind of huge fish lives to this day, that being the Whale [Kohola]. When their ship was let go in fair winds, and in the middle of the night, while everyone was enjoying their sleep, there was one of them awake then, that being the man who was bent over the oar of that ark of theirs. While he was crouched over the oar of their ark, that little ship of theirs came upon a storm, and all the gear was blown away by the wind and the masts were snapped and the oars were broken; and because of this storm they ran into, they couldn’t do a thing; all they could do was to sit calmly looking out for land or a ship to save their lives. Ka Leo o ka Lahui, Buke II, Helu 586, Aoao 1. Novemaba 21, 1892. The Nuuhivans.—Upon the sail of the New Hokuao to Fatuhiva, eight Nuuhivans returned to the land of their birth, those were the people who lived with Rev. J. Bicknell [Bikanele] in Ewa. On this past Sunday night, there was a great gathering at Kaumakapili Church, to hear the words of gratitude by some of these people as they leave Hawaii nei. Here are those who were placed in the church of Ewa from amongst these people: Daniela Kao, Davida Line, and Iakobo Hiki. And these three were the ones who gave speeches at the church in Hawaiian. All who entered listened carefully to their speaking of Hawaiian. According to them, they are returning to teach about the light of life in their unenlightened lands; and they bid all of Hawaii to pray on their return, that they may be put on land safely, and soon teach the words of the kingdom of heaven. Before being released, the entire congregation donated money for their daily needs, and $40.00 was collected, along with capes that were gifted. Last Monday, the benevolent brought gifts and gave it to the treasurer of those people. Therefore, it is as if this is the enlightening voice announcing to the devout Hawaiians to pray for them. And we can say without doubt that you will all join in in praying for them. We are appending the names of the people who returned: Daniela Kao, Davida Lima, Iakoba Hii, and Elizabeth Kahiau. They joined the church of Ewa this year. Tahuhu, Patehe, Tahu, Waitoi, and Mego (female), did not become brethren. According to them, they came along with the Honorable John Ii; there were twenty of them. When they landed in Honolulu, 11 of them lived with John Ii, and nine went with Rev. J. Bicknell to Ewa, and one of those died; those in Honolulu from amongst them are 6. One stayed in Hawaii, and one went on a whaling ship. They came all together, and a portion returned home. Ka Nupepa Kuokoa, Buke VI, Helu 13, Aoao 2. Maraki 30, 1867. First death notice in a Hawaiian-Language Newspaper? 1834. On the 11th day, the whaler named Orion arrived; from Nantucket. Gifford is the Captain; 13 months voyage, 300 barrels of oil. The Captain informed us of the death of Captain Swain, Captain of the Averick, the ship that brought the missionaries, Mr. Spaulding and company. He died at Paita, South America. Ka Lama Hawaii, Makahiki 1, Helu 5, Aoao 2. Maraki 14, 1834.